Let me sleep will you?? Hope you are sleeping well and not feeling as crabby. Obviously, I am not (neither one). Can’t get enough caffeine, myself. Understand why we might be a little “touchy”. Thanks for sharing! I’ll never make 3 in a row, but when I can get here, I always enjoy it! I love all of these….I really resonate with the last one! Nice haiku! caffeine helps me out as well! *Phew* Nearly missed it! 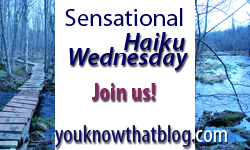 I only remember it was Wednesday when I saw Madeleine’s blog! I have added my contributions! Loved these, especially the last one. I have my crabby moments, but always feel guilty afterwords. Grumpy Bumpa – not a pretty sight. all three are wonderful! Why is it when you’re a little kid you need to sleep but don’t want to and when you’re old you want to sleep but no one will let you? Haiku #3 is so me!!! I’m in too good a mood today to ponder crabby… but I managed! Back to the real me. Trust me, she should know. week. End is in sight!